I’m sitting here after a fantastic couple of days looking after nephew number 2, with my mum, whilst nephew number 3 was being born. I have to say I feel truly honoured, not only because I have the most amazing nephews (not to mention a fabulous niece) with such individual personalities that- even though they can be incredibly cheeky and just a little bit stubborn- they never fail to make me smile, but also because we have the most amazing families that have accepted and welcomed us as a couple, not just into theirs, but their families lives. We hear horror stories, thankfully less and less, about people who are ostracised by their families for admitting who they are and who they love, yet the Dazzler and I have never experienced this. It doesn’t mean there aren’t falling outs, we are all only human, but these have been related to run of the mill things rather than about who we are. 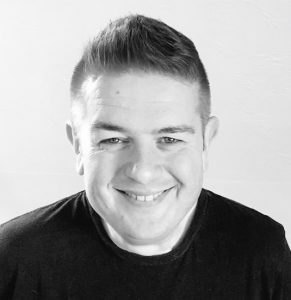 There is lots of talk about traditional families and about LGBT adoption or surrogacy/doners, but sometimes I think we forget that the nuclear family is a relatively new concept and that being part of an extended family is something that is often overlooked and can be incredibly supportive and rewarding. 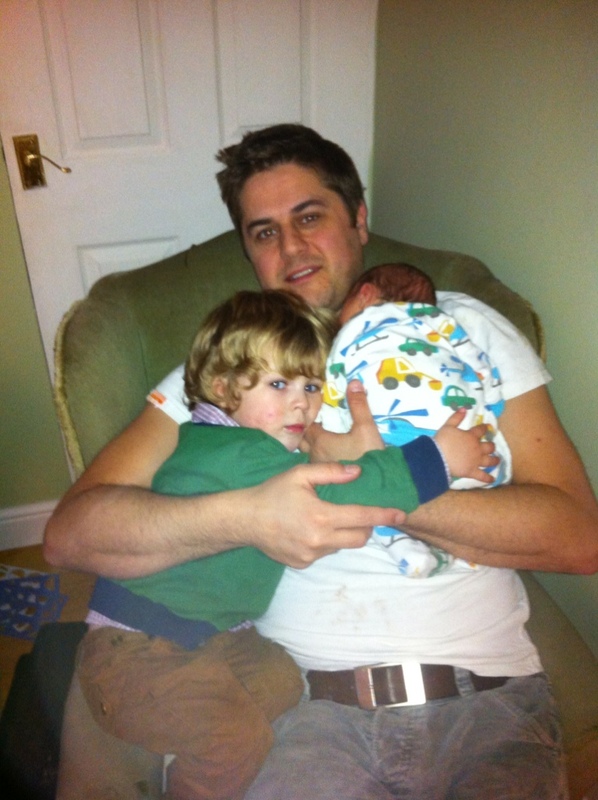 Here is my wonderful brother, the lawyer, with his 2 day old and 2 1/2 yr old boys!! I love each of my nieces and nephews unconditionally, and would happily give a kidney or take a bullet for each and every one of them. They are my family, whether by blood or ‘marriage’, and I feel glad for having them in my lives. I’ve been the fun uncle and I’ve been the bad cop when I’ve needed to be, I’ve bathed them, I’ve held them when they’ve cried and I’ve laughed at their silliest of jokes!! I’ve cheered when they’ve played rugby and I’ve made them birthday cakes and I’m a better person for that. 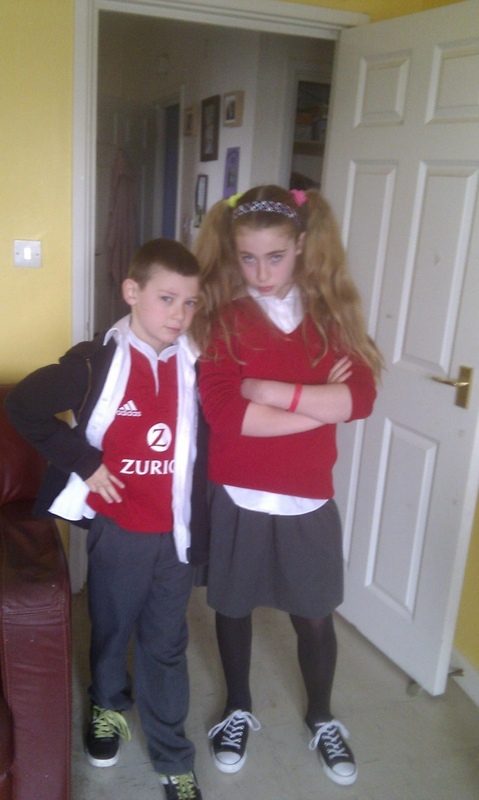 To complete the set here are my other nephew and niece, dressed as angry school kids for Red Nose Day!! Spending time with our families has been an eye opener. I’ve seen things I would never have seen without them, from my niece dancing like nobodies watching at her birthday party to my nephews weeing over their dads, and we’ve learned loads. Most of all it’s meant The Dazzler and I have been able to have informed conversations about fostering and adoption and about the realities of being parents. We also know that, should we make the decision to go down either route, our families will be there for the ride!! So for all those of you who have considered adoption, or having a baby of your own, don’t forget the power of your extended family. Not only are they the most incredible revelation about parenthood but they put all your other problems into perspective!! Previous Post Where do I belong?